Deflation Watch (May 2010): Headline Deflation Is Back! 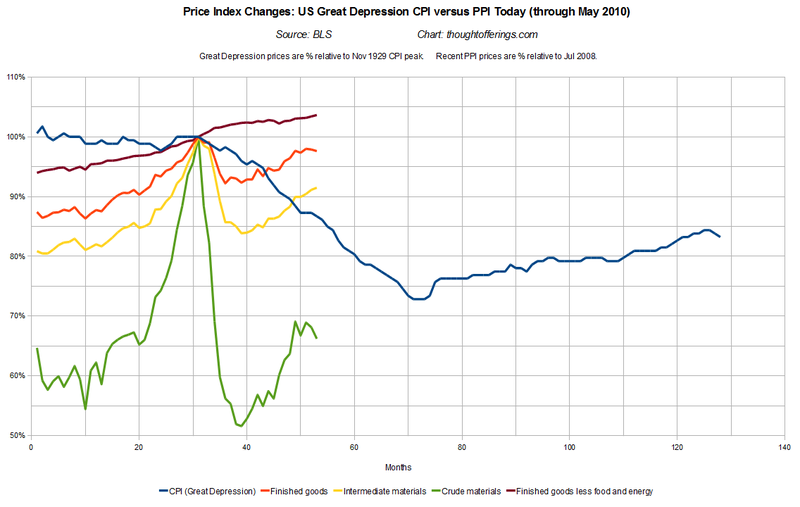 April and May brought a renewed decline in the headline consumer price index, however it is not yet clear whether this trend is ready to stick. And curiously (and a little unexpectedly) rents seem to have stopped falling, at least for now. Have Residential Rents bottomed? - Calculated Risk says "There is some evidence that apartment rents have bottomed ... at least temporarily." And from the BLS: "The indexes for both rent and owners' equivalent rent were unchanged in May." "With supply following demand, as with any monopolistic arena, it looks like the world crude oil balance remains very much neutral leaving the Saudis in full control as swing producer where they set prices and let quantity adjust to market demand. 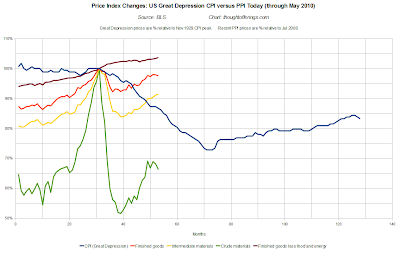 Stable crude prices with 0 interest rates, high excess capacity and low aggregate demand should keep inflation at bay indefinitely, with productivity increases making deflation the greater risk." 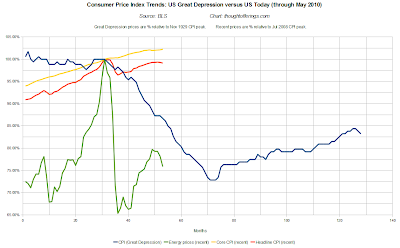 I should note that this chart isn't intended to show we are following the Great Depression path, as we are clearly not (more details in the original deflation post), so perhaps a new chart is in order in the future. 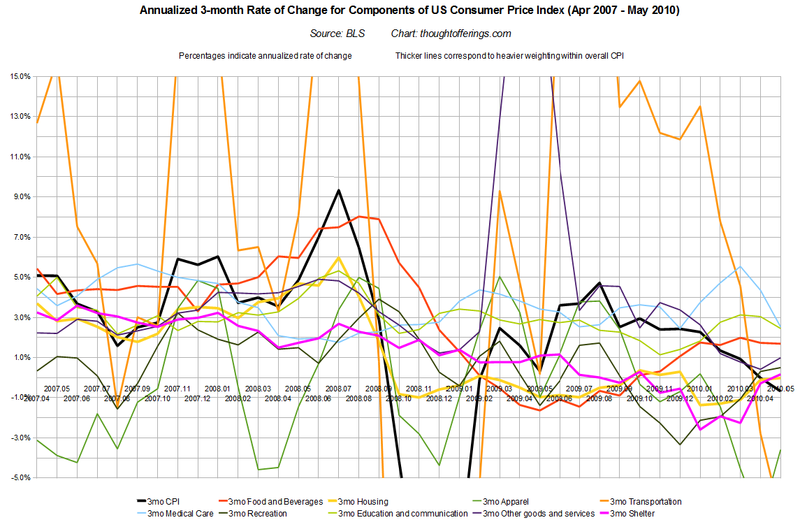 However, it is looking like the headline CPI (red line) has been changing direction and may not make it back to the peak level from July 2008! 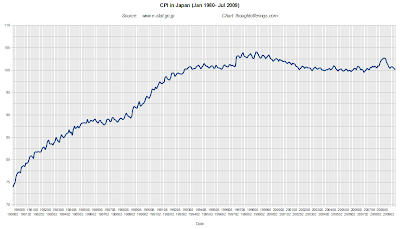 The three month trend in CPI has gone negative for the first time since late 2008! However, transportation (dominated by energy prices) at -6.9% (annualized three month rate) and apparel at -3.6% (annualized three month rate) seem to be the primary drivers of the latest deflation. Housing (and its subset category, shelter) seem to have stopped declining, at least in recent months. 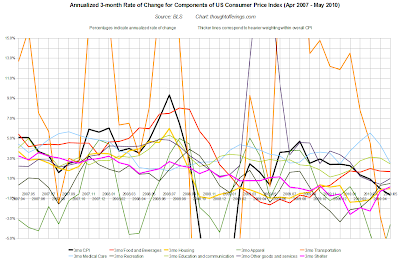 The other components are all in positive (but sub 3%) inflation territory, with varying levels of volatility. Will we stay in negative price change territory? 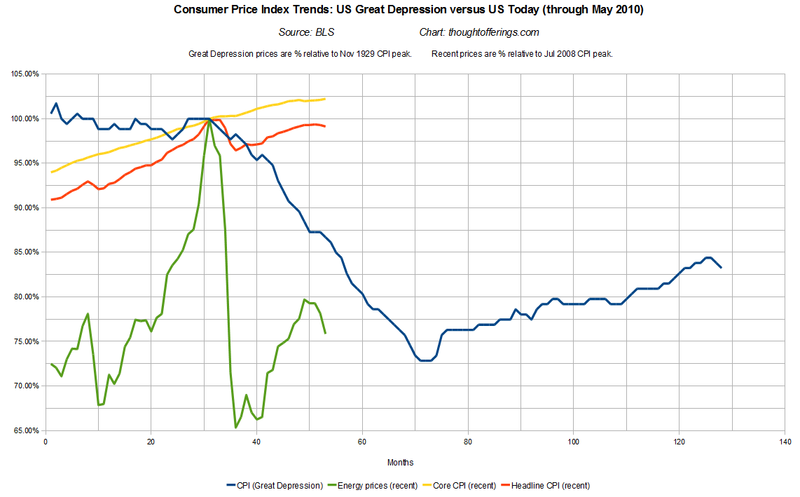 It seems likely the drag from energy prices will come to an end, so the answer is far from certain in the short term, though the overall dis-inflationary trend is nowhere near over. Slowing in China, austerity in Europe, and the peaking of housing bubbles in countries such as Australia, Canada, and the UK could all contribute to a sustained end to rising commodity prices. 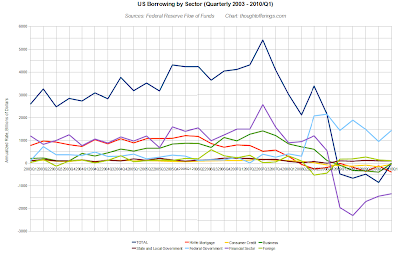 Q1 Charts of Total Borrowing: Involuntary Deleveraging via Defaults, or Frugality? 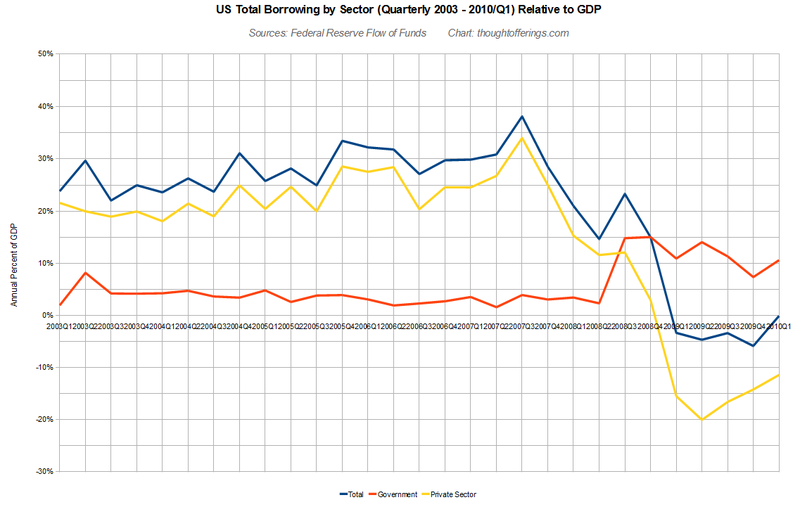 The contraction in private sector borrowing (yellow line) appears to be in a declining trend. Total borrowing (combined private and public sectors) has gone marginally positive! 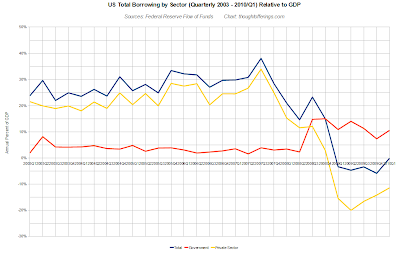 The largest component of the private sector is the financial sector, and its contraction in borrowing (purple line) has been getting smaller, though at a slower rate. 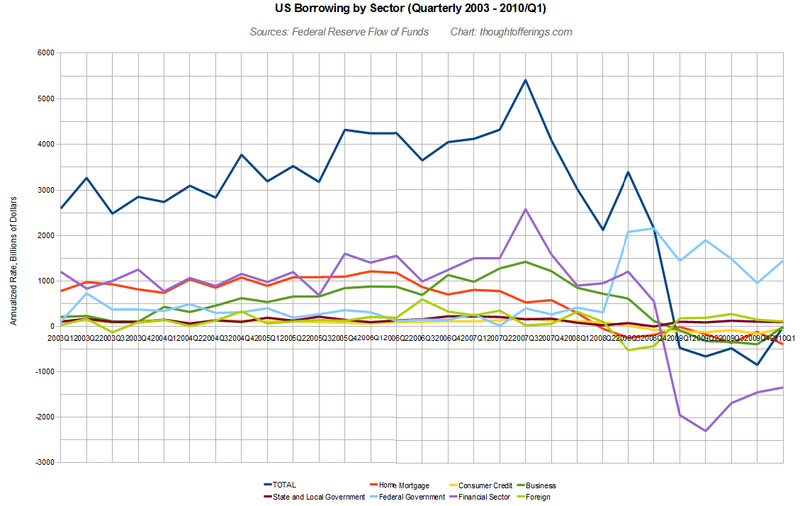 Notably, business borrowing (dark green line) was roughly flat in Q1 after contracting for four consecutive quarters. 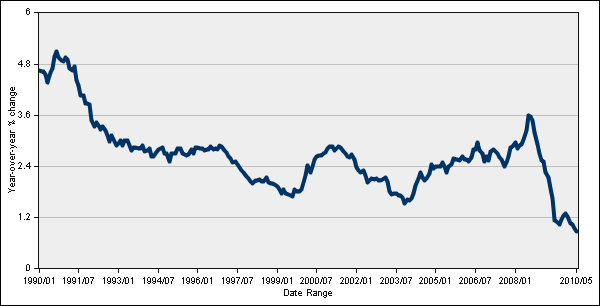 But home mortgage borrowing is contracting faster than before. What best explains the private sector's negative borrowing rate? And why is the rate of decline getting smaller? In my last update I linked to some data that suggested "consumers haven't actually been paying down credit card debt since Q1 2009 — they've actually continued to add to debt, whether out of necessity or choice — so the overall contraction since then has been all due to charge-offs." Credit card debt is only one kind of borrowing, but it is likely correlated with consumer attitudes toward debt and therefore future trends in borrowing. Edward Harrison, always a worthwhile read, is continuing to question whether consumers have really found frugality. In his latest post on the topic, he concludes: "Bottom line: people don’t change unless they are forced to do so. Americans are as spendthrift as ever. Wait until the economy hits a rough patch – and then we can talk about the demand for credit." Many other commentators (myself included) have tended to assume that consumers are becoming more frugal after being burned by debt-driven asset bubbles and would both choose to incur less new debt and to pay down existing debt faster than before. This is the multi-year deleveraging process that so many expect. There is evidence to suggest this is occurring, but also conflicting evidence suggesting that defaults, not voluntary repayments, explain the primary trend. Understanding this dynamic is key to understanding likely economic outcomes and whether this is truly a non-temporary balance sheet recession as described by Richard Koo. Thoughts? Evidence I've missed? New developments can of course change current attitudes and behaviors. Household wealth stands a good chance of declining again due to (a) a resumed decline in housing prices as the effects of the absolutely enormous government support for the housing market diminish somewhat, and (b) potential further drops in stock prices (more on that another time). Might lower asset prices (and especially directionally declining asset prices) lead to an increased frugality? It would be tremendously useful in understanding macro trends to have government data like we have now in the Z1 and other reports, but disaggregated into various household wealth and income tiers. Such data could go a long way to distinguishing between trends driven by economic stress versus trends driven by choice. Unfortunately I don't know of any source of such data (and it would likely by necessity be collected from small sample sets, anyway). "The dwarves delved too greedily and too deep. You know what they awoke in the darkness of Khazad-dum... shadow and flame." 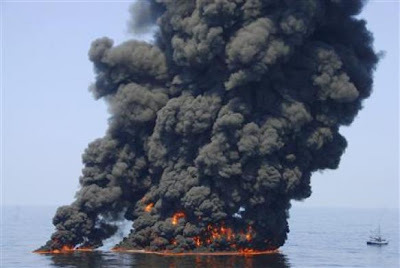 Apologies to non-Tolkien fans, but this example of life imitating art/literature struck me when I first read about the Deepwater Horizon explosion and oil spill. Tolkien powerfully captures the clash of nature and industry as one of the recurring themes in his Lord of the Rings trilogy, and tragically this disaster has some uncanny parallels. For those not familiar with the story of the Lord of the Rings, when the dwarves delve "too greedily and too deep" they awaken a Balrog, a demon of shadow and flame, and it proves too powerful to overcome. After much loss of life, the magnificent underground city and mining operation is abandoned. Of course, the evidence is that this incident was avoidable, whether or not the driver was "greed" or a dysfunctional and reckless corporate culture (BP had an astonishing 760 egregious willful citations at refineries versus 1 for other companies in the same period!) . 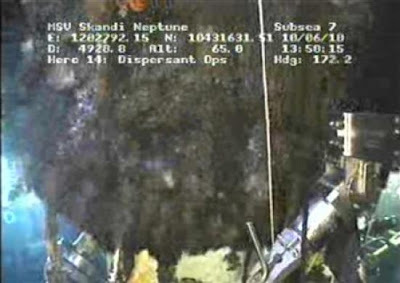 Yves Smith has provided solid coverage over recent weeks, and yesterday excerpted a letter sent from the government to BP: "In effect, it appears that BP repeatedly chose risky procedures in order to reduce costs and save time and made minimal efforts to contain the added risk." (much more via the link). A guest post by George Washington and a link highlighted by Yves Smith both get into the possibility of undisclosed damage to the system and the threat of an accelerated flow of oil with no credible way to contain it at the well site. A knowledgeable commenter on Yves' site concludes "the relief well has to work. They will have to keep trying until they intersect the well." 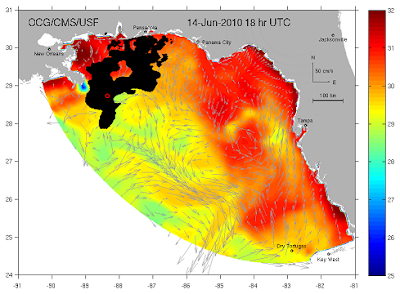 If you need a less alarmist perspective, think of the oil spill relative to the Gulf of Mexico as "ONE raindrop in 10 olympic sized swimming pools" (and better mandate all wildlife to cease swimming or landing in the vicinity of said raindrop until further notice!) I suppose this is a bit sarcastic but I actually find it a worthwhile data point as food for thought, despite believing it to be rather misleading.